Are you a manager who leads Gen-Y employees? If you answered yes then you already know Gen-Y is unlike any other generation you've had the opportunity to lead. If you try to manage Gen-Y using an old, outdated, command-and-control style of leadership, this generation will walk out your door before lunch. And before the end of the day, they'll blog, IM, and text about their experience (warning their friends!). Times have changed and managers must change with the times or be left behind. The most effective way to lead Gen-Y is using a coach approach. In the IATF Leader As Coach Fast Track Program, participants learn how to make the shift from a traditional style of leadership to that of Leader-Coach. The IATF Leader As Coach Fast Track Program is a new and highly interactive distance learning program led by Tom Heck, President and Founder of the IATF. Gen-Y expert Bea Fields (coauthor of Millennial Leaders) visited with the participants in the summer 2008 IATF Leader As Coach Fast Track Program session and she shared important information about how to manage Gen-Y. Participants were able to ask questions and get specific answers to their management questions. Click on the link below to listen to the 60-minute recording of Bea Fields when she visited the Leader As Coach Fast Track Program summer 2008 session. If you want to become a leader (or an employer) of choice among Gen-Y then you need to know what Bea Fields is teaching. I'm Tom Heck, President & Founder of the International Association of Teamwork Facilitators with your July 2008 edition of the IATF Teamwork & Leadership Ideas e-Newsletter. Subscribe HERE for free. In this issue I'm especially excited to share a new audio interview with John David Mann who co-authored a wonderful book entitled "The Go-Giver -- A Little Story About A Powerful Business Idea". In this interview you'll hear John share his "Five Laws of Stratospheric Success" which are all based on the power of giving. As you'll hear in this unique interview, the most successful people all share a common trait: they are excellent givers. CLICK HERE to listen to the interview. The number of subscribers to this teamwork ideas e-newsletter just passed 36,000 (from 103 countries!). It is an honor to support the good work of so many people. One of the benefits of having so many subscribers is that I get to field questions from an amazingly diverse audience - - large (and famous) international organizations, small mom-and-pop businesses, non-profits, military, health care, education - - all of whom are looking for ways to build and motivate high performing teams. With so many great resources available at TeachMeTeamwork.com to help you build your high performing team, which one will provide the greatest Return On Investment (ROI)? The answer is learning how to lead using a "coach approach". All the work I do with teams and the people who lead them is based on the new paradigm of Leader As Coach. Jack Welch, the former Chairman and CEO of GE known for his innovative management strategies and leadership style, has said "People who are coaches will be the norm. Other people won't get promoted." Are you ready to learn how to lead using coaching skills? Are you ready to take your career and your team to new levels and do it in a sustainable way? If yes, then check out the new IATF distance learning program: Leader As Coach Fast Track Program. This intensive and highly interactive program is guaranteed to help you shift from an old command-and-control style of leadership to a new more dynamic model of leadership based on coaching skills. Right now I'm leading a 7-week summer session of the Leader As Coach Fast Track Program with 50 managers from the US, Canada, UK, South Africa and the Virgin Islands. We're in week 5 and program participants are finding the experience to be invaluable and are reporting amazing results (more on this later). Helium Stick -- are we all headed in the same direction? John David Mann -- Five Laws of Stratospheric Success for Teams -- lessons from the must-read book "The Go-Giver"
Seven Edge Strategies For Modern Day Teams -- Wednesday July 23, 2008 and it's FREE. All who attend receive a $37 gift. We are living in one of the most radical times in the history of business, and radical times call for radical leadership. Teams are now living in the "hot zone", that place in business where risk, fear, doubt, pressure, uncertainty and change can get the best of the most savvy leaders. Join Tom Heck, Head Coach at TeachMeTeamwork.com and Bea Fields, Executive Coach and coauthor of Millennial Leaders and Edge A Leadership Story, for a live and interactive TeleSeminar on Wednesday July 23, 2008 from 1 to 2 pm EST where we'll discuss the seven critical strategies teams of today need in order to not just survive but thrive in the business world. Why do thousands of leaders from around the world access the teambuilding resources here at the IATF? They're all looking for strategies, tactics and tools for building successful teams. This book is short, easy to read and understand and absolutely compelling which is why I contacted one of the authors John David Mann and asked him to share the wisdom of this book with the IATF community through an audio interview (link below). In the interview, John shares "The Five Laws of Stratospheric Success" and how you can use them to experience more success in your own life while helping your team become more successful. The Go-Giver offers a highly accessible exploration on what it means to give -- to be generous. Take a look at the front page of nearly any newspaper (if you dare) and you'll see mention of "economic downturn". In such an environment you might be paying closer attention to how you, your team and your organization are compensated. What determines your level of compensation? In this audio interview (link below) John David Mann explains one of the laws shared in The Go-Giver called "The Law of Compensation" which states "Your income is determined by how many people you serve and how well you serve them". Your understanding of just this one law could change your life and the team you lead forever. I found author John David Mann to be fun and energetic during the interview. He provides excellent examples of how to apply the Five Laws in real life situations. The Minefield teambuilding game is easy to setup and lead and is perfect for a group as small as 4 people and as large as 50. You (the facilitator) create a "minefield" (obstacle course) using whatever supplies you have on hand. In the video clip below I setup the playing area using Toobeez pipes and balls. You can also use chairs, paper, hoola hoops, etc. to create your minefield. There are variations to this teambuilding game including picking up puzzle pieces as you travel through the minefield, avoiding mousetrap, and more. Over 100 new and different lead-it-yourself teambuilding game write-ups and growing! All this and MORE when you become a member of the International Association of Teamwork Facilitators. CLICK HERE to explore the list of member benefits. Ben-Shahar is a Harvard Professor and his class on happiness is reported to be the most popular on campus. Harvard students pay upwards of $50,000/year to attend this iconic university and they sign up for a course on happiness?! Could it be that many of these students will go on to lead teams - - some will be managers, some CEOS, some will create wildly successful start-ups. And if they can create a team or a company that is filled with happy employees, they will gain a significant competitive advantage in the marketplace (reduced turnover, HR dept focused on building capacity rather than putting out fires, increased productivity, reduced stress, fewer sick days, etc.). Old-school, command-and-control style leaders didn't concern themselves with helping their employees / team members understand and become happier. Times have changed. Now leaders must lead their teams in a way that inspires and draws out the best in people. The result? Happier employees! 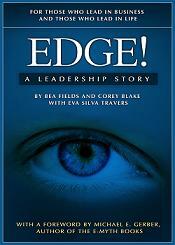 New leadership book by Bea Fields: "Edge - A Leadership Story"
In today's changing world, leadership is a skill which is tried by many and only mastered by few. Why? Because many leaders are unaware of the influence of their words, actions and deeds. They say things they wish they could recant. They lead from a place that is inauthentic. They don’t stop to think that their most critical team members are ready to jump ship, because they are bored, worn out and restless. The new book, EDGE! A Leadership Story, co-authored by my colleague, Bea Fields addresses these very concerns. Using a provocative approach, the book delivers a powerful message about authenticity, courage and human development through the engaging story of a modern day leader, Mitchell James, his team and his executive coach, Kate Nelson. Bea Fields is a friend and colleague and I'm excited to help her announce this important book. I want to support Bea in accomplishing her mission: to help millions of readers get closer to becoming a leader who will have a profound and positive impact on the people in their lives. I believe this book is breaking new ground in both the profession of coaching and the world of leadership, and I feel certain that you will be inspired by this work for years to come. PricewaterhouseCoopers is one of the worlds largest professional services firms. PwC employs over 146,000 people and the newest hires are from Gen-Y (aka Millennial Generation). How do you effectively lead Gen-Y? This is the question virtually every organization in the world is asking itself right now. PwC understand a different type of leadership skill set is required to manage this generation and they've even produced a short video clip (below) to help their managers get a grasp of what's required. Gen-Y responds best to a style of leadership called the "Manager As Coach". This style of leadership is very different than the "traditional" leadership model of command and control (useless with Gen-Y). Learn how to manage using the Coach Approach in the IATF Leader As Coach Fast Track Program. Humor in the work place is important. But how should you be humorous? Done incorrectly and you'll damage your team. Done well and the team grows stronger. Click here for an explanation as to why humor in the work place is important. Click here for a few simple rules to follow when using humor in the work place. An organization known as Improv Everywhere staged one of the coolest examples of teamwork I've ever seen. Watch the video clip below. It's truly amazing and wonderful. The leaders involved in this cool stunt are able to pull it off because they use a Coach Approach to leadership. You can learn these skills in the IATF Leader As Coach Fast Track Program so you can work miracles with your team. The Magic Carpet teambuilding activity is easy to lead and requires simple and easy to obtain props. Create groups of 6 to 10 people and provide each team with a "Magic Carpet" (a tarp measuring 5 feet x 5 feet). The team stands on top of their tarp and is then asked to "flip" the tarp over without anyone touching the ground. This is a teambuilding game you can lead with small groups or large groups (500+ people). If the groups collaborate this teambuilding game becomes much easier. You'll see an example of collaboration in the video clip below.